More than 1,100 people have been arrested in Ethiopia since the nation declared a state of emergency following the prime minister’s resignation last month, state media reported Saturday. Hailemariam Desalegn’s surprise resignation came after more than two years of anti-government protests and increasing divisions in the ruling party. The Ethiopian People’s Revolutionary Democratic Front (EPRDF) has for the first time picked an ethnic Oromo, Abiy Ahmed, to be its new leader. “They were detained for killing peaceful civilians and security forces, setting houses and financial institutions ablaze, illicit movement of firearms, destroying government and public institutions (and) blocking roads,” Fana reported, citing Tadesse Hordofa, chairman of a board overseeing the decree. 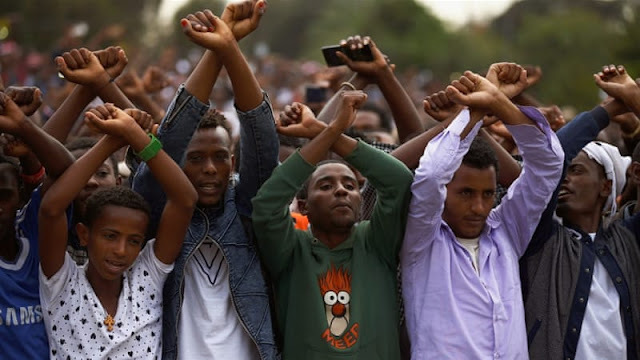 Ethiopia spiralled into crisis in late 2015 when the country’s largest ethnicity the Oromo began protesting a plan to expand the borders of the capital Addis Ababa into the surrounding Oromia region.